Tommo was nudging and nurdling, but with the score on 11 was involved in a tragic run out with opener Bradders (Wrench). Undeterred, Bradders carried his bat and with two overs support from s-Cullen Cross Bones they had the score move on to 22. Following Marrows stuffing of Yubby in the first game of the President’s CliMAX-Sixes (also for the Grant Trophy and reported elsewhere), Super Kings made their debut in CliMAX. A strong team led by CliMAX-Original Ben Pigott were pitted against the champions of Hatherley and Reddings CliMAX-Sixes 2010 ‘The Marrows’. The Marrows respecting the tournament rules of rotation of batting order throughout the competition sent in James Hicks and Fred Rawlings, both in scintillating form fresh from 50s for Ebrington in the Cotswold Hills League games. The pair batted through their allotted 5 overs and cleared the ropes 3 times whilst compiling 76. Hicks led the way with 42 not out, supported well by Rawlings who scored 31. Gareth Langman took the game to the Marrows, who seemed in a stew, as Langman hit MAXima off Turner and Flighty Keyty. Then Flighty pulled on all his CliMAX experience and drew Langman, looking for his century ball, out of his crease. There was enough turn to beat the bat and deft work by Hicks saw Langman on his way stumped for 27. Flighty then turned the screw even tighter with skipper Ben Pigott holing out first ball caught by Turner. Jack Groves was fully of confidence, having made his first century the day before for Campden. He batted majestically, scoring 2 MAXima in 39 not out and Rich Bryan provided some impetus with 16 from 6 balls. The final score was only two lusty blows away from beating the Marrows – 60. Super Kings had the challenge of batting first against Yubby and made a strong start of 21 between Luke McDonagh and George Tyler before Sam Elson caught a steepling catch to removed McDonagh off the bowling of Tom Frost. The second partnership of Tyler with Gareth Langman was even more promising, compiling 34 before a devastating run out of Tyler who had taken just 3 balls to score 12. Super Kings must have thought they had the ultimate player to walk in with 8 balls left of the five over innings – Ben Pigott. But Ben crumbled under the pressure that CliMAX brings to even the most accomplished cricketers and he was competently caught again by Elson for just 1. With two balls remaining Langman and Rich Bryan gratefully scrambled a bye and then overthrows to take the final score to 4. Yubby were not to be challenged by this score, though adopted a positive approach sending in Witters The Whacker with Sam Elson. When Elson was out in the first over, skipper The Face of CliMAX Mamba Collins sent in Tom Frost to maintain the difficulties of bowling to batsmen of incredibly different reaches. Frost was resolute and batted through the overs for 6, whilst The Whacker thrashed his way to 21 from 14 balls. What with a smattering of extras Yubby had totalled 53 to win this match in convincing style. The Marrows batted first against Yubby in the return leg of President’s CliMAX-Sixes and this was to prove an extraordinary game. Josh Keyte could not handle the pace of Elson and was on his way back to the hutch after 3 balls. This brought Nat Gregory back to the crease he sent this first delivery out of the ground. A typical single from the end of Elson’s over had, The CliMAX-Kid facing The Face of CliMAX - Yubby skipper Josh Mamba Collins. The Kid played with unusual caution and opted to take a single and remove himself from the danger end. Unprotected Will Turner was undone by Mamba’s venom and The Face stared him from the wicket. Hard Man Haydn Jones was to have none of it and hit hard twice collecting two and then four runs for his efforts. The Kid now was at his preferred end to take on Claw Whitmore. Curtly Ambrose-esque, Claw banged it in half way. Those long legs took those big feet out and over the line and with no-balls giving free hits, the Kid was in paradise. Pulls and hooks flew from the park and in 5 moments of madness his score had shot up by 11,110. Hard Man Haydn did not want to be outdone and plundered his own MAXimum off Frost, but Bradders (Wrench) committed the cardinal sin of bowling a no-ball on the last scheduled delivery of the innings opening the way for The Kid to score another 100 from a free hit and four from the extra ball that gave him. The Marrows had broad grins as they set about defending their imposing total of 11,276. Not one to complain, Squeeler was given the task of opening by The Face who himself would take first ball from bowler of the day Flighty Keyty. The pair survived until the last ball when Flighty enticed The Face to hit in the air and straight to Hard Man who took the catch with suitably soft hands. The third over proved a turning point, with Turner also taking a wicket due to the catching Hard Man Haydn. Panic set in to the Yubby ranks and Sam Elson was run out immediately. Cool as a cucumber, Cullen (Squeeler) batted on and found excellent support from Tom Frost (11 not out) who played an audacious sweep off The CliMAX-Kid to complete the innings. Squeelers admirable contribution was 32 not out including a huge MAXimum also from the suffering Kid. Luke Mc Donagh (37) and Jack Groves (27) made a superb start to the game against Marrows. They had notched up 38 before Flighty Keyty was able to force an error. This time Rawlings took the catch in the deep. Fred Rawlings then came good as a bowler, persuading the umpire to rule in his favour with an LBW appeal against McDonagh. If that wasn’t bad enough for the Super Kings, Tyler was out to Jones at the start of the last over. Bryano and Piggot were caught up in the chaos and both were run out in a dramatic over, which of course left Super Kings with the disaster of a total of zero. The only hope for Super Kings was to get a wicket at the end of the innings and restrict Marrows to less than 3 MAXima to enforce an unlikely but possible victory. But the Marrows are old hands at CliMAX, and after a minor kerfuffle when Hicks was bowled by McDonagh, Will Turner and Fred Rawlings calmly compiled a satisfactory unbeaten partnership of 55. Of course, an individual may score more than the team in CliMAX and this was the case for Fred Rawlings who finished on 147 not out having score consecutive MAXima before Hicks departure in the second over. Yubby had to bat first against the Super Kings who were looking for the first win of the tournament as they reached the final game of the tournament. The Face of CliMAX found a new partner in Whacker Whitmore and the game will be remember for his consecutive MAXima, which led to a curiously exhilarating dance in response to the adulation of the crowd that had amassed to watch the CliMAX tournament. Deservedly this was later recognised as the Champagne Moment, though it was not entirely clear if this was for the dance or the whack that preceded it! Sadly The Whacker (129) perished, as others before and many to follow, trying to achieve the third consecutive MAXimum. This gave Rich Bryan a wicket and one of the more valuable ones of the tournament saving Super Kings 145 runs. 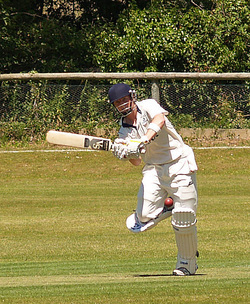 The Face walked off shame- faced in the final over of the innings have tried to take liberties with the bowling of Charlie Tyler and despite a timely MAXimum from Tommo the innings produced a meagre total of just 12. Surely now the Super Kings would gain that victory they sought, even if they failed to score 12,590 which was still required to overhaul the Marrows point total in the tournament. Yubby had the even more unlikely task of taking 6 wickets of consecutive balls for their tally to overtake the Marrows. The teams appeared to be wilting in the heat by this time - the scorer (Peter Gregory) too, who cannot vouch for the accuracy of ascribing runs to the correct batsman during this game. Nevetheless, the scorecard reads the Rich Bryan score 1165 before being run out and Ben Pigott 21 before being LBW to The Face Mamba Collins. Whoever it really was, they did score three consecutive MAXima again from the luckless Claw and so were within one more MAXimum of closing the gap on the Marrows to a few hundred points. Yet the game turned as only CliMAX can and Mamba’s double wicket over clinched the game again for Yubby. The Face was smiling again!